While watching some footage on Hurricane Irma wreaking its havoc through the Caribbean and the USA in September 2017, the television broadcasters were lamenting that the radio broadcasters were ‘losing’ and ‘losing out’ because people were tuning into their TVs for the coverage the visuals of TV offer, rather than listening to radios. Immediately, I furrowed my brow. Since when did news become about winning and losing? Isn’t news for all? Isn’t it actually a service for everybody, equally? 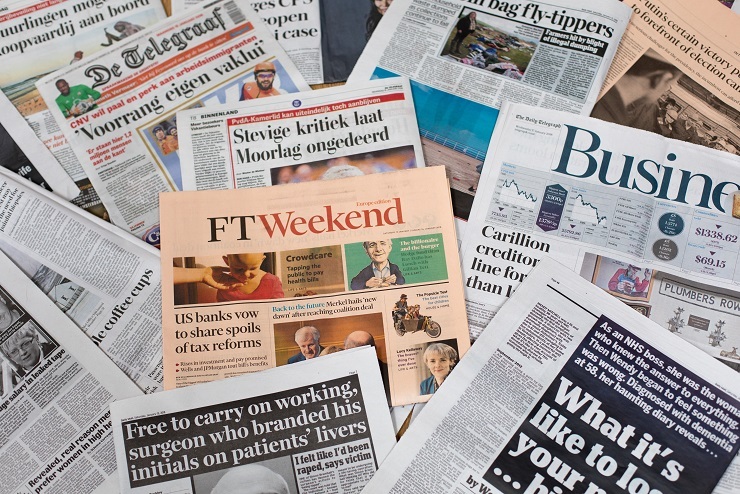 Why have we made providing news a competition? What is newsworthy is that our worldwide media has become about advertising deals and making money based on readership/viewership levels – the going rate for a commercial during the 2017 USA Superbowl was US $5.02 million (1). It’s based on clicks and shares on social media, achieved all the more depending on the degree of drama, sensationalism, scandal, ability to stay front page for longer etc. The more terrorising, horror-full, exposing, painful, weird, attention seeking, alarming or impactful the reporters/journalists can make a story, the better. We have awards for best or most courageous journalist; awards for frequency and variety of topics covered by one journalist; awards for breaking news within 36 hours of the story breaking; best investigative journalist awards and best in-print or online reporting. We have prizes given for the stories that impact multiple parts of society; prizes for best in health care reporting; for ‘intrepid’ reporting on conflict, corruption or human rights transgressions; prizes for reporting on corruption, women’s rights and refugees; and prizes for best environmental journalism. And we have awards to “honour journalists who risk everything to bring us the news” and for those who “persevere under the most difficult circumstances” (2). To me this begs the question: why have we made it good and desirable and now even necessary to ‘risk everything’ for a story? Why are we worth so little as human beings that we have made it acceptable to risk our health or life for recognition? The news isn’t all bad though. Some of these awards can be useful and relative to the industry of reporting, (good/truthful) news opening our eyes to things that otherwise might stay hidden. News has the ability to bring people together through the shared knowledge of aspects of life. If only this was all news was used for. So what if we were to (only ever) honour and celebrate journalists/media outlets through an appreciation of their respectfulness, decency and dedication in providing true stories for the public? Let us not base our recognition on rewarding journalists’ behaviours, at times outrageous. So often these behaviours aren’t all that lovely. Let’s now look at an example of the difference between the reporting of modern day news versus how it was done some 70 years ago. In the Samford Museum (Queensland, AUS) there is a wall of old newspaper clippings from the 1947 train crash when a train derailed between the Ferny Grove and Camp Mountain stations. The newspapers from the day cover the accident quite graphically and in great detail. You get to understand that this was definitely a catastrophic event that killed 16 people, injuring 38 more. But you get this from the facts, not from the author’s opinion or use of emotive language. The story was covered thoroughly to provide a true account of what happened, with no words like ‘inexcusable,’ ‘shocking’ or ‘appalling’ needed; no need for a call to action from readers. Simply, the paper told the story as it happened. Punishments or damning those responsible wasn’t called for, as that was not the responsibility of news in those days. If we were to read a report of the exact same incident in a newspaper today, we would get the facts, yes, but they would be some 20% or so of the story, – the rest given over to hypothesizing, calling for castigations of those responsible or criticising/critiquing the system that allowed the accident to occur. Journalism these days strives to inflame the reader, to garner a response, so much so that it appears we have become almost numb to horror, needing the most reeling story to elicit a response. We have become overstimulated through emotion. And so about this numbness to horror. Because we have become desensitised, are we choosing to not feel the pain of what we are exposed to until it becomes so, so bad? Are We, the readers or consumers of media, actually the ones asking for more and more sensationalism for our news? Is it because We demand this style of journalism first that we are then supplied or fed the lies and half-truths we call news? Perhaps it is Us that is both the cause and the problem. If this is indeed the case, and I do suggest that it is, then we will continue to go around and around, most likely sinking lower and lower into the stakes of indecency as We demand and are supplied what we call for. Ask, and you shall receive. When will we have had enough? Enter Universal Medicine in the News: The True History. This is a website written by people who have first-hand experience of press abuse and has been written “to restore journalism to the decency of its purpose” (3). Any person or any business who has ever been written about where the journalist has omitted the finer details, embellished the story to attract a wider audience (“don’t let the truth get in the way of a good story,” they say), or plainly made up ‘facts’ because the true story didn’t seem enticing enough, has been abused by the press. I dare say there would be billions out there that this has happened to. Over time we have learned to not believe everything we read in the papers. But why should this be so? I want to be able to see truth in everything I read. Why should I have to discern what’s true or not, reading with skepticism or doubt, knowing facts may not have been verified, skimming through the emotive words and phrases to get to the real truth? The call to action from this article is for people to reach that point too of being sick and tired of everything the majority of the media industry stands for today and ask for it to change. Because we have the situation now that money talks – readership levels and consequent advertising dollars mean the difference between the survival of a publication or not – we-the-consumers are in the perfect position to demand change. If We choose to remain deliberately ignorant to the harm being caused through the media industry, then We remain part of the cause. If We ALL choose to not face the fact that We are asking for what the media presents, then We ALL remain part of the cause. If We ALL are not part of the answer – the change we want to see – then We ALL remain part of the cause. What we are silent about is what we accept. org. (2017). The History of Super Bowl Commercial Costs. [online] Available at: https://www.ama.org/publications/marketingnews/pages/history-of-super-bowl-commercial-costs.aspx [Accessed 30 Dec. 2017]. Free Press Award Nominees (2017). [online] Available at: https://www.freepressunlimited.org/en/free-press-awards-nominees [Accessed 30 Dec. 2017]. Universal Medicine in the News: The True History. (2017). Universal Medicine in the News: The True History. [online] Available at: https://www.universalmedicine.news [Accessed 30 Dec. 2017]. Born playful and curious, a deep love and wonder of nature's simplicity and awesomeness. Lover of giraffe, zebra, elephant. Can be found diving under rolling waves at the beach, creating culinary masterpieces over a campfire, talking to planes, walking Daisy dog or simply being a sweet presence in my young daughter's school. The lure of space has got into me as the family prepares a move to some acres in Brisbane to raise a family of alpacas. Distorted news coverage of an organisation that I know a lot about has opened my eyes to the corruption that’s eaten through the media. I used to listen to the news whilst driving to work but now it leaves a bitter taste. It’s not that I hadn’t noticed this bitter taste before, I’d just ignored it. News offers only more disharmony of that which is it reporting. Ah don’t get me started on the media! This medium has the opportunity to do so much true good yet the media has to this day contributed to the demise of humanities respect and standards towards one and other. Medicine in life – ‘say it how it is’ – no drama, no stimulation, no emotion, no reaction – facts just as it is and delivered with absolute love. What a breath of fresh air, a livingness in which I do my best to commit to. Thank you for bringing this to our attention Suzanne, the decline in mainstream commercial media & the increase of hype & emotion has been slow and steady. Sometimes we have to go back to another era such as your example of the reporting on the train crash before we see the difference so starkly. The media seems to have gone from a slant to a spin to fabricating a whole back story and taking things completely out of context not to mention omitting the facts that don’t suit the dramatic story and sensational headline. Some journalists are out and out bullies ambushing and attacking people inciting an emotional outburst; which is their goal rather than the truth. I agree we do have to look at our part in this and be honest have we chosen to ignore the truth in favor over an emotive story? We are part of the cause if we partake in what our media presents to us … well said Suzanne, and it brings it back to the simplicity of how we take part, and how in that taking part we are saying yes to what our media dishes up to us. And until we truly see this and live asking for truth to be presented to us, we will remain part of that cause, so a great call for us all to examine our relationship with the media we consume. The ugly truth is that the general media today reports lies, we know it and we do not question it. We allow the corruption of true standards that honor and represent us all to continue to spread to all aspects of life, through our unwillingness to stand up and speak out about what we know and can feel is not true in our day to day lives. The whole set up of the media is around drama and sensationalism. it has become the new TV – we all want excitement in our lives – and so the papers are reflecting this. But in doing so we have stripped journalism from the truth of the role – the unbiased reporting that once was.